After a few days in Kyoto, my sister and I met up with our cousins on a day trip at Nara. We only spent a few hours in Nara, before heading to Osaka. Nara is famous for their deer park next to Todai-ji (Buddhist temple), where there is literally deer everywhere!! You can pet them, and buy deer crackers to feed them. Just be careful not to get head-butted by a deer! We went to Izasa, a sushi restaurant in Yume-Kaza Plaza, just around the temple. I ordered the Izasa Tempura Set (¥1,680), which had 5 pieces of kakinoha sushi and izasa sushi with assorted tempura, sesame tofu, and Miwa somen. My cousin ordered the Yoshino Set (¥1,680), which had 9 pieces of kakinoha sushi and izasa sushi with tempura Miwa somen. 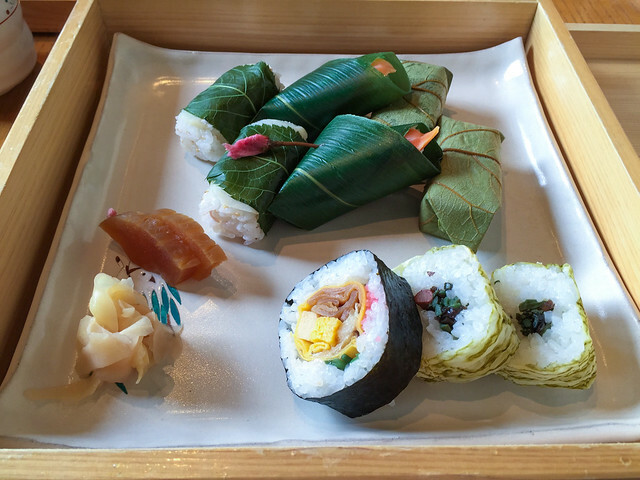 One of Nara’s specialty foods is kakinoha sushi, or persimmon leaf sushi. 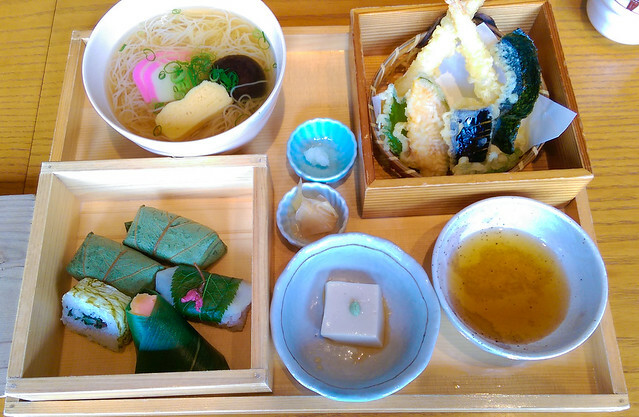 In the above photo, it is the leaf wrapped sushi in the upper right. Unfortunately I was too hungry and forgot to take a photo of the sushi, unwrapped! A specialty born of Nara’s long history and favorable climate is kaki-no-ha zushi (persimmon leaf sushi). A local dish of southern Nara, it consists of vinegared rice topped with mackerel or salmon and wrapped in a persimmon leaf. The aroma of the persimmon leaf gives the sushi a mellow flavor. 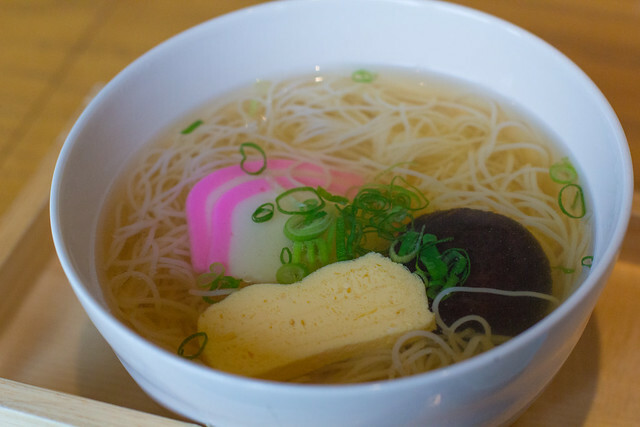 Another specialty from Nara is Miwa somen, which we had served in a cold broth with tamago, kamaboko, and mushroom. Originally known as mugi-nawa (“wheat strings”), noodles have been produced for more than 1,200 years in the Miwa area (present-day Sakurai City). High-quality wheat flour is made into dough, then stretched to form noodles no more than 1 mm thick. In winter, the snow-white noodles can be seen drying outside on special racks in the cold, dry air.